The term Register Transfer refers to the availability of hardware logic circuits that can perform a given micro-operation and transfer the result of the operation to the same or another register. Most of the standard notations used for specifying operations on various registers are stated below. The memory address register is designated by MAR. Program Counter PC holds the next instruction's address. Instruction Register IR holds the instruction being executed. We can also indicate individual bits by placing them in parenthesis. For instance, PC (8-15), R2 (5), etc. Data Transfer from one register to another register is represented in symbolic form by means of replacement operator. For instance, the following statement denotes a transfer of the data of register R1 into register R2. If (P=1) then (R2 ← R1); Here P is a control signal generated in the control section. It is more convenient to specify a control function (P) by separating the control variables from the register transfer operation. For instance, the following statement defines the data transfer operation under a specific control function (P). The following image shows the block diagram that depicts the transfer of data from R1 to R2. Here, the letter 'n' indicates the number of bits for the register. The 'n' outputs of the register R1 are connected to the 'n' inputs of register R2. 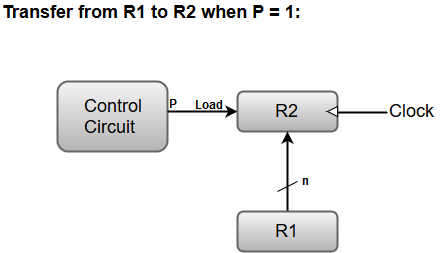 A load input is activated by the control variable 'P' which is transferred to the register R2.